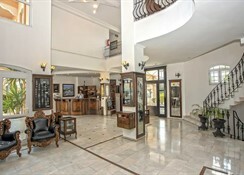 Sinatra Hotel is a 4* hotel located in the beautiful area of Kemer â?? Turkey, 300 metres from the beach and 60 kms away from Antalya Airport. 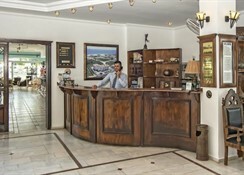 The hotel offers a variety of amenities such as swimming pool, snack'lobby bars, restaurant, fitness centre, sauna, conference center and children facilities. Guests can relax in the spacious, beautifully decorated rooms and suites of the hotel which are fully equipped and have magnificent view. Sinatra Hotel is the ideal place for relaxing and pleasant vacations. Sauna & Massage, Billiards, Darts, Internet, Safe, Water Sports, Telephone, Fresh Juices, Ice Cream, Mini Bar, Imported Beverages, Doctor, Laundry, A La Carte & Snack Service are Separately Charged. Foods & Beverage service is not available on the beach.